Whether it’s the nickname, his cheerful personality or his epic brawl with pitcher James Shields, Coco Crisp is a guy you don’t forget. Born and raised in LA, Crisp has been on four teams during his 9-year Major League career. He came up with Cleveland, won a championship with the Red Sox, and played one injury-plagued season in Kansas City before joining the Oakland A’s last year. A couple weeks back we had a good chat with the A’s center fielder. After appearing in only 124 games the last two season, Crisp is healthy and excited about his team’s chances this year. During our interview, we talked about his nickname, his charity work, baseball brawls, the A’s outfield, speed vs. power, Charlie Sheen’s UCLA batting practice, who’s got the nastiest stuff and who’s the most underrated pitcher in baseball. CS: So you started last season on the DL and you’ve had to deal with some injuries in the past. Are you fully healthy going into this season? CC: Yeah, for the first time in a long time. I think last year was really a challenge for me to even be ready to start the season. Then I end up breaking my finger to start the season which probably was a little blessing in disguise because I don’t know if my shoulder was really 100% ready, but I was good enough to play at a level to compete. So I broke my finger and it was very disappointing to the guys before the season started. But you know like I said, it was probably a blessing. Maybe I would have re-injured my shoulder and then I’d be out the whole year. Right now I feel great. I’ve been in really good shape, able to work out just like I normally would. I’m just ready, ready for the season to start. CS: Is the team as a whole healthier this year than they were last year? CC: At least to start this season. We got a little banged up towards the end of last season. To start the season last year, we were pretty healthy I think. Sheets was coming in as a question – whether or not he was going to be ready. Myself, I was a question mark. But for the most part, I think this year there’s no question marks on if anybody is going to be healthy – with the exception of maybe Sweeney and I think he’s doing really well. I know Penny was dealing with some stuff this year. But I think everybody is ready to go and I think our health and our team is really good. CS: What do you think about the team’s chances this year? CC: I think they’re greater than last year. I thought we had a great chance last year to win our division, the way our team was structured. You know the thing that we were just talking about—the injuries last year—that kind of changed our season a little bit and made it difficult for us to compete. And we still did a great job of competing, because of our pitching staff was so phenomenal, or is phenomenal. I think with the addition that we have this year and with some luck and just being blessed and staying away from injuries, I think this year our team is stronger. We have filled the need that we were lacking last year – which are some power players. I think that bringing those players – I mean we still have speed, we have defense and our backbone is our pitching. The only thing that I felt that we were a little low on was power, and they did a great job of addressing that this year. CS: Do you think with all the additions in the offseason that you’ve got a crowded outfield or is that a good problem to have? CC: Well for the team (laughs). For the team, that’s always a great thing because you have that many good players that you don’t know who to play out there. You have a lot of options. For the manager, it can get a little bit difficult I think because of those options. It puts a little strain on him. Because they’re so good and probably so close – I mean I’m trying to say “they” but I’m in there I guess – it can be difficult on us to try and shuffle and maneuver guys so they don’t get upset. On a personal level, you want to be out there every day playing. That’s the heart of the champion and a winner and those are the type of players we have on our team. You want to be out there helping the team. You want to play, you don’t want to just cheerlead. From the top, it’s a good look, but all the way from the bottom it’s kind of like, I want to be out there playing you know. But you don’t want to be that guy to mess up team chemistry either. So I think with the crowded outfield, and the personalities that we have in that outfield, I think we can deal with what might happen or the toughness of being in a crowded outfield. But I think everybody wants to be out there playing. I think depth is always a great thing on the team though. CS: So are you fired up to be playing with David DeJesus again? CC: Yeah, that’s my boy! We had good chemistry in the outfield when we’re playing. You know, we didn’t play that long together, because I did get injured in 2009 very quickly in the season. But in spring training, we grew that chemistry and through that first month, it was easy playing alongside him because his moves were easy to see. If he was going for the ball, it was easy to read you. That’s kind of how me and Sweeney were last year as well. That’s just because they are really good outfielders and the communication level and they way they go about it is very similar, and it makes it easy to play alongside them. That’s always a great thing. There’s no fear of running into each other, getting injured. And as a center fielder, there’s that respect that if I’m calling for it, he backs me up proper. I mean just being a good outfielder makes it easy. CS: Now you guys are a young team but you’ve still got a lot of veterans, including yourself. Who would you say is the clubhouse leader in Oakland? CC: Wow, I think from different aspects, I think this year it’s hard to say. I don’t know. I know I’m more vocal. Sheets is a very vocal guy. He was last year. Raj [Rajai Davis] was there last year, he was the leader of our chapels. So there’s different leaders in the clubhouse, and it’s not just about baseball sometimes. Elli [Mark Ellis], you know he’s been there for a long time. So you look at those guys. You look at the guys who are not just older guys, but guys who have also been there throughout the duration of their career. He’s one of those guys, so if I was going to pick somebody I would say him. CS: What do you think is more important in baseball, having speed or having power? CC: This day and age, it’s flipping to more of an old school game where speed was more relevant in baseball back then. Then it turned over into power and now it’s kind of coming back to that. But for a ball club I think both are essential in building a team. CC: I think you can get away with having less power and more speed guys, than just having a power hitting team, because speed doesn’t slump and power does. You know? So you have a lot of guys that just go for the gusto. It can be a tough time winning with those guys even though it’s going be a fun team to watch. Everybody loves to see the long ball. But the small ball – the bunting, the slap hitting, stealing bases – that can also be fun to watch. It’s just a completely different game. I think the consistency of speed, I think I would choose over power. CS: Yeah, that makes sense. Who do you think has the nastiest stuff in the American League? CC: Ah cha cha cha, that’s a good question! Oh man. You know, from the left side, C.C. Sabathia, he’s probably one of the filthiest pitchers in the game. I know Cliff Lee throws an invisi-ball. CC: It’s like you see it and you’re like, I’m gonna tattoo it, and all of a sudden it just disappears on you and you’re like, wow I missed that? He comes right after you. I think Brandon League, his stuff is filthy. He just doesn’t exactly know where he’s going to be and that’s what’s kind of scary. CC: (laughs) He’s up there throwing freaking 100 miles per hour up there. It’s moving everywhere and you figure one of these times it’s going to move into you by accident. He’s pretty difficult to face. You know so many guys. You say American League… I’ve been fortunate enough not to really have to face the A’s pitching staff last year, so I know they’re pretty difficult to face. CS: Who do you think is the most underrated pitcher in baseball? CC: Oh man. Okay. I haven’t been asked that question. That’s a good one there. I would say it would be me. CC: Nobody’s seen me up on the mound. They won’t know where my ball is going either. I’m like a knuckleballer without a knuckleball. Just because the speed of my throw. But everybody is used to like 90 plus and I’ll be throwing like that 75. CC: 75, 85, with minimal movement that will throw everybody off. They won’t know what you do (laughs). CC: Most underrated pitcher… you know right now I have to go with somebody on my team because they haven’t got the notoriety as of yet that they’re probably going to get this year. I have to say Gio Gonzalez. CS: Gio Gonzalez. All right. CS: How did it feel when you made the final catch in the 2007 ALCS that sent the Red Sox to the World Series? CC: It was a good moment. Simply because me and Ellsbury had been shuffling the whole year, and they were leaning more toward going to Ellsbury and put me in for defense. I didn’t give up, so I’m out there trying my best and we’re obviously still going to win the game, but I’m just playing my heart out out there. Just trying to stay in there mentally and play my best. So when I ran that ball down and made that catch, it was more of like, yeah we clenched, but it was more internal, more like victory for myself. So it was a great moment for myself and it will always be that. CS: I know the season’s a grind and games can go on forever, how do you stay loose throughout the season? CC: For the whole season? Ice. (laughs) Ice. A lot of ice baths. Hot cold tub. Keeping it light mentally, you know clowning around. Having a routine to follow, it kind of set your mind at ease. I think your teammates help you out too, because that bond between the guys in the clubhouse, that back and forth kind of keeps you at ease, playing cards and all that. Mentally, it takes a lot of stress out of your day. Instead of just sitting down and thinking for eight hours about for 8 hours about what’s about to go down during the game and who you’re facing and everything like that. I think having a good clubhouse really allows you to focus in the beginning of the game. Not on baseball, but just be around it, and prepare yourself in an easy way. And then your training staff is a big part too. Whether it’s your strength coach or the doctors or the actual physical therapists, the trainers in there that take care of you. Those guys are essential in keeping the 162 game grind going. CS: Now you mentioned keeping it light, what kind of pranks do you pull on the younger guys? CC: Well there’s the classic end of the year rookie prank of the dress up, everybody knows about that. Then there are some other things that you can’t necessarily talk about. I mean there’s one where you go out to dinner… Dang, I don’t know if I want to give this up because then everybody will know about it. CC: (laughs) I can’t give up the prank. I don’t want to be that guy to say those funny pranks that people know like, oh so this is going to happen, he’s not gonna get me, you know. But you know keeping it light, there’s some fun stuff especially on the young guys. It’s nothing too crazy. It’s all in fun and love and everybody gets a kick out of it. Even the people that are getting pranked, after the fact it’s more like a relief, like a joke you know. It’s all in fun and everybody has a good time with it. Can’t disclose too much, though. CS: I heard that you were at UCLA when Charlie Sheen was taking batting practice recently. How did he do? Can that guy hit a pitch? CC: Yeah, he’s pretty good, nah he’s really good. It’s surprising, because there’s a lot of other athletes that try to play baseball or hit. Like, I’ve seen LeBron James try to take some hacks and some other guys. Not saying that they’re terrible, but just giving Charlie some props, man. He was really good. Obviously, he’s been in baseball movies and I heard he played in high school and was really good in high school. So all that kind of correlates to when you’re older you’re still probably pretty good. So he was out there taking hacks and hitting balls to the warning track. And we didn’t even have good balls. We weren’t cheating with major league baseballs, the nice pretty pearls out there. We had like some used baseballs that the leather’s not really tight on, and he was still socking them really well. CS: How did you get your nickname, man? CC: Well, my real name is Covelli right, Covelli Crisp. My great grandma used to call me “Co” for short, Co Crisp. I have a little sister, about 2 ½ years younger than me, and friends, we all grew up in the same little apartment complex. We used to hang out, throw balls and talk crap, talking nasty to each other, I used to clown sister and clown my friends and joke around and just be a knucklehead. They would try to clown me, but it never really did work or I didn’t really care what they were saying. Finally, a cereal box came in the house with a cartoon character on it, with big ears and the box was “Coco Krispies.” Now, I had large ears. CC: I kind of grew into them a little bit. But back then, you should see some of my pictures, my ears were protruding a little bit, like what’d you say? 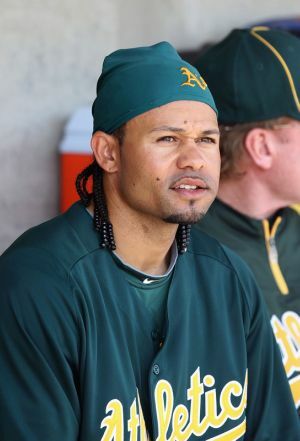 (laughs) So they started calling me “Coco Crisp” like the cereal character. They’re like, oh the character’s name is ”Coco” that’s what we’re gonna call him and that’s you. So I hated the name “Coco” for however long they called me that, like a month or whatever. Those jokes kind of die out and then you try to throw it out there again like once in a blue moon. In Double-A, I filled out a questionnaire saying who’s your favorite actor? What’s your favorite food? Nickname? Yada yada, this and that. So I filled that out. On the questionnaire, I wrote down my nickname that I had as a kid which wasn’t really a nickname, it was more of a joke, but it was the only thing that I really had as a nickname. Nobody called me anything else. So I just put “Coco” down. One of the guys on our team thought it was funny. And at this time I wasn’t really hitting that well. Like .250, and the year before I was the minor league organizational player of the year. And so I was like focusing too hard, I don’t know what was going on. Anyway, I walk up to the plate, still focusing too hard, trying to hit better, and one of the guys thought it was funny and before the game he told the announcer and the score guy to put it up there on the scoreboard. So I walk up to the plate and he says, “now batting, Coco Crisp.” And I’m walking up to the plate all seriously focused and them I hear that and I’m like umm… it just messed me all up. Took my focus all away and everything. So I step to the box and I’m kind of flustered. And I see the pitch, first pitch or whatever, and I smack it. Pow. Base hit. I’m like, oh okay. It had changed my mentality from over-focusing to relaxing more and not thinking about anything but my stupid name that was on the scoreboard. I couldn’t think about baseball. So anyway I had a good game and another good game. The numbers start rising. About a month later, I get traded to Cleveland, and the name comes with me over there. I’m hitting over there, so I say leave it up there. It was like .417 or .427, whatever I was hitting. Somebody gets hurt up top in the big leagues. I was in Double-A and they called me up to the big leagues. So it was like a month and a half span where I was actually Coco Crisp. Now I’m up in the big leagues, the name followed me up there. 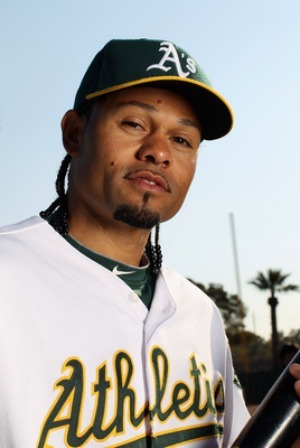 “Now batting number 10, Coco Crisp.” So in a month and a half – m y entire life I was Covelli before – but after a month and a half, I was Coco Crisp. Now I’m stuck with the name that started off as a joke! It’s still kind of a joke, but I’ve accepted it. It’s cool now. So that’s the story. CS: Nice man. So you think Dallas Braden is still pissed off at A-Rod? CC: There would probably be like a replay. CS: Now I know you’re a big boxing enthusiast. You like to box, you watch boxing. Did you get into that brawl with James Shields just so you could show off your boxing skills? CC: (laughs) The answer to that is no. CC: In the game… outside of the game it’s completely different, I have no hard feelings. Even in the game now, I have no hard feelings towards him. With anybody, you know, I don’t need to hold grudges, you know. I have a forgive-and-forget type of mentality. But anyway, in the game in the moment there are certain things, certain unwritten rules that happen within the game and sometimes there’s a thin line and it’s a blurred line and sometimes it’s crossed or somebody thinks it’s crossed and then there;s some back and forth and then things happen like that. But I can say that is in the past and hey, I just enjoy facing him now. CS: When you’re involved in a bench clearing brawl, what’s your mindset? What are you thinking? Are you trying to inflict pain? Just make a statement? CC: (laughs) It depends. I’ve been in three now in baseball. That one, that is known. There was one in college and one in the minor leagues. All different, all different situations. Me, I was directly involved with the one seen on TV – as seen on TV – and the other two indirectly. It’s more like if you’re involved directly, then you’re going to actually fight. The other ones, it’s more you’re there to break it up, but if things are around you, you have to fight you know? So it’s a different kind of mentality with both things. But to inflict pain? Not necessarily. When I ran out there I didn’t go out there with the intention to 187 somebody. CS: It’s not even a thing. CC: (laughs) Yeah, you know, it’s fighting so whatever. CS: So you’re from LA, you were born here, you grew up here and I understand you’re involved in a few charities out here. What are you involved in? CC: Well there’s a couple that are very close and dear to me. The main number one thing is RBI, Reviving Baseball in the Inner Cities. They work in conjunction with Major League baseball now because they became so global and they helped so many people. They’re tied in with me, because as a kid, growing up there in the inner city myself, you can get lost. My dad, my parents, did a great job of finding avenues where they would lead me in the right direction. RBI Baseball was that right direction for me. It helped me strive to be better in the classroom, and as a person and on the baseball field. I got travel, see some of the world. It helped me realize that this is what I wanted to do, play baseball. I ended up winning a World Series with them in 1995. It was the first RBI Championship World Series. It’s moments like that you never want to take back, you just hold on to. I don’t know if I’m the first person to win an RBI World Series Championship then win a World Series championship, so look into that. CC: (laughs) But you know, that’s definitely one charity that’s helped me a lot. Another charity that I just recently got involved in is Read Across America, which is dear to me because as a kid I had trouble reading in classroom in front of people. With that, I couldn’t really get out of my shell the way that I wanted to. I mean I was like a class clown and a fun type of person all the time. But in the classroom sitting down, it was like, “ah don’t pick me to read, I don’t want to read.” I could read, (laughs) but it was just trying to get out of your shell and be comfortable with who you are. I think this program allows kids to do that. I think reading in school is the most essential thing in learning. You have to do it all the time. The simplest thing for me now is reading bedtime stories to my kids or the more significant thing for me is looking over contracts. Also, I have speaking engagements where I have to read off Teleprompters and things like that. Getting kids started at a younger age will allow them to have more confidence in doing things and putting themselves out there to be able to try different things that they normally wouldn’t have. I think it’s a really good program. Print article This entry was posted by Chris Stout on March 9, 2011 at 12:29 pm, and is filed under Sports. Follow any responses to this post through RSS 2.0. Both comments and pings are currently closed.